Somehow RLJE Films' DVD and BluRay release of Robert D. Krzykowski's The Man Who Killed And Then The Bigfoot last week slipped us by. Fear not, because we still have three (3) copies of his film on DVD to give away to our U.S. readers. 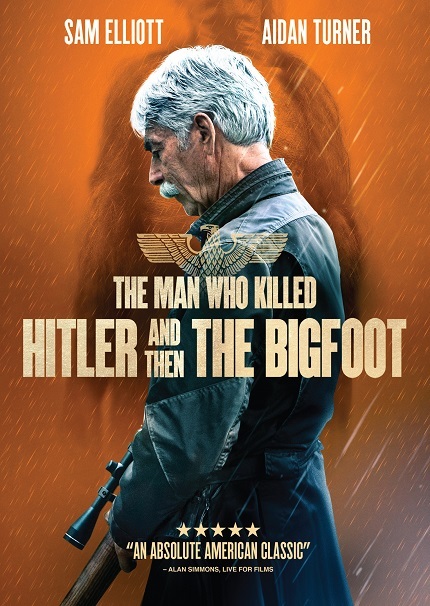 THE MAN WHO KILLED HITLER AND THEN THE BIGFOOT follows the epic adventures of an American legend that no one has ever heard of. Since WWII, Calvin Barr (Sam Elliott) has lived with the secret that he was responsible for the assassination of Adolf Hitler. Now, decades later, the US government has called on him again for a new top-secret mission. Bigfoot has been living deep in the Canadian wilderness and is carrying a deadly plague that is now threatening to spread to the general population. Relying on the same skills that he honed during the war, Calvin must set out to save the free world yet again. The giveaway is open to readers in the U.S. Entries are limited to one per family and household. To enter simply email us the answer to our trivia question below. All entrants with the correct answer will be part of the random draw on Friday, April 12th. The visual effects were created by which two-time Academy Award winner? When you have found the answer email us here. All correct entries will be included in the random draw on Friday, April 12th. You have until Midnight PST on Thursday to enter. Good luck to all.